In July we got started with the Midnight Mystery Quilt, hosted by Cheryl at Meadow Mist designs, by cutting all of our fabric. In August, the sewing began. Our task was to make 36 flying geese units. I love the no-waste sewing method that Cheryl chose. Here are my flying geese. Since I'm a little behind on posting about last month's sewing, this month's directions are already out. We'll be making square in a square units in September. I have a few other projects in the queue before I'll get a chance to work on those, but I hope to be showing them off soon. Posted in Quilting. 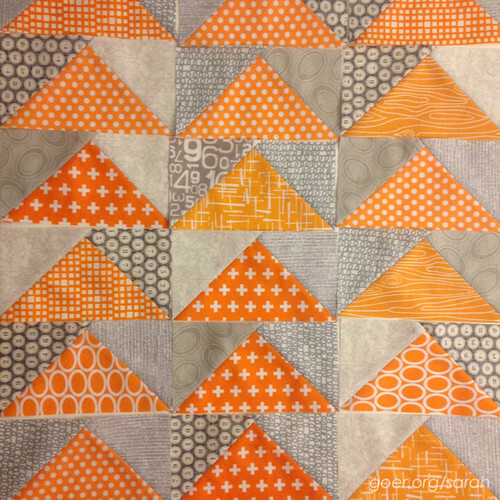 Tags: Midnight Mystery Quilt, mystery quilt on September 11, 2015 by sarah. I love your color scheme so much! I really like the "cohesive scrappy"-ness. I like that: cohesively scrappy. Thanks. I'm having fun with it. It's not my normal palette. Yes indeed... when I get a moment. I think the square in a square blocks will be fun to make. And I'm excited to start using a third color. :-) Thanks for vising, Allison. Your geese look great Sarah. I haven't posted my geese yet....may save them until I get the next bit done. I'm gonna try to post monthly. For a variety of reasons August got away from me... let's just pretend this post went out in August. ;-) Thanks for visiting, Lisa. Your geese look great; I really love orange! I like the SiaS blocks for September because they combine 3 of our fabrics together, so I look forward to seeing yours. Mary, you are so sweet!! I'm just sitting down tonight to work on a mini charm square project and tutorial for a blog hop next week. After that I'll need to get to work on bee blocks and Midnight Mystery for this month (I'm feeling so behind seeing everyone else get their square in a square units done!). Thanks for visiting! I love your fabric choices, the geese look great! I have never tried that method of making flying geese so thank for including the link. Yours look wonderful and I love the colours you have chosen. 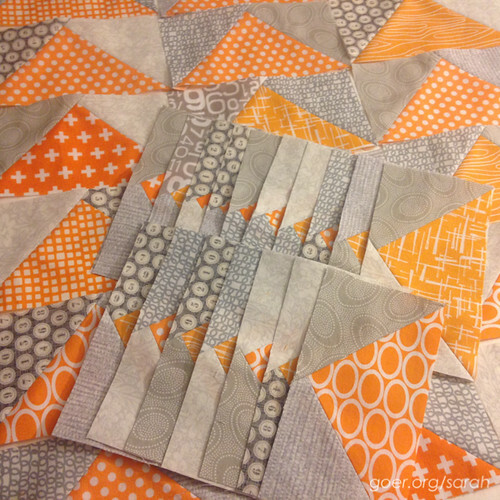 It's hard to stay on top of all the quilting that I want to be doing. Don't even ask me how mu Patchwork City Block of the Month is going. ;-) Thanks for visiting, I hope to have more Midnight Mystery to show you soon. Orange...my favourite colour. So bright and fun looking. I haven't started my square in squares yet. Oh Sarah--great fabrics/colors...they are going to add such sparkle to the finished quilt. And you've motivated me to trim up my flying geese units and get started on the Square in a Square units--I too am a bit behind! Thanks!! Thank you, Mel! I'm excited to work my teal into the mix with the Square in a Square units. Maybe this weekend! :-) Oh, I just checked out your blog. Love the colors you chose for your Midnight Mystery.